The variety of species in a sample, community, or area. over time. Evolutionary biologists synthesize the evidence generated by all of the other fields of biology (paleontology, ecology, anatomy, developmental biology, and genetics) to create a unified understanding of process of evolution as it occurred on Earth. As new evidence is discovered, the model adjusts accordingly and becomes more complete. A group of organisms (usually species) that are more closely related to each other than any other group, implying a shared common ancestor..
Analytical method used to find a hypothesis of relationships among species, by coding the various states of homologous characters; also called cladistics. is almost always done today using one of the many computer programs written specifically for the method. However, a very simple example can be done by hand. See the Cladistics Activity to see how this is done. A group of organisms (usually species) that are more closely related to each other than any other group, implying a shared common ancestor. (which we call the family Pectinidae, the scallops). Pectinidae is supported by two characters: #1 ears or auricles present, and #2 radial sculpture present. Crassostrea is their closest relative; the clade including Pectenidae + Crassostrea is supported by one character: #3 a single muscle scar. Character #3 (muscle scars) has two changes on the tree, from 0 to 1 (two equal muscle scars to two unequal muscle scars) between Mercenaria and Mytilus, and from 1 to 2 (two unequal muscle scars to a single muscle scar) between Mytilus and Crassostrea. This tells us a story about the evolution of the muscle scars. Muscle scars (and of course the muscles that made the scars) primitively exist as two equal-sized scars (as in Mercenaria). 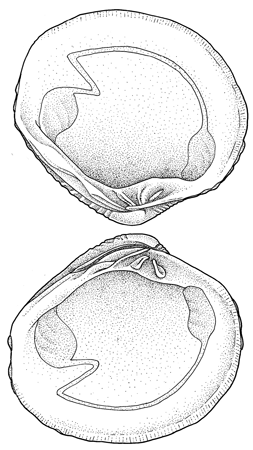 The first step is a reduction in size of one of the two muscles (as in Mytilus), followed by the loss of the smaller muscle, resulting in a single muscle scar (as in the clade that includes Crassostrea + Pectinidae). 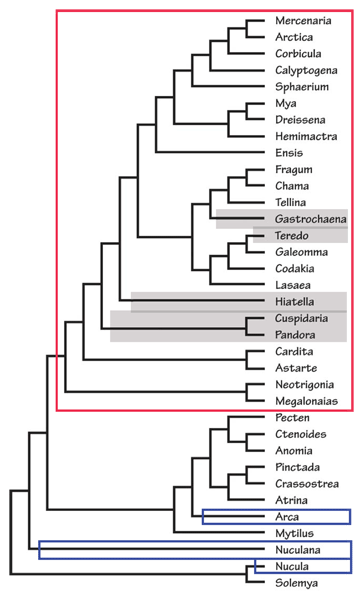 Evolutionary biologists around the world are generating phylogenetic trees of small to large groups of organisms. Each tree usually starts with an analysis of living species, and then is completed by adding the extinct ancestral forms found in the fossil record. This is because molecules and soft bodies, which include many useful characters, are not available for fossils. Evolutionary biologists have produced a Tree of Life for bivalves. It includes many taxa, but is far from including all known bivalve families or genera. This particular tree was published in 2002 and will continue to change as additional projects are completed, and as additional species and characters are added. A group of organisms (usually species) that are more closely related to each other than any other group, implying a shared common ancestor. 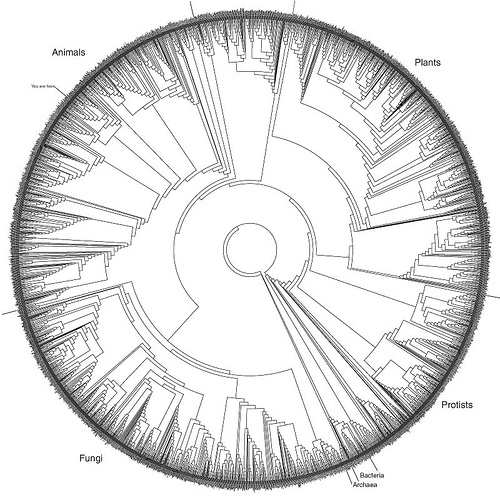 or branch on the evolutionary tree includes all of the species descended from a common ancestor. The ancestor is represented by a node or branching point. 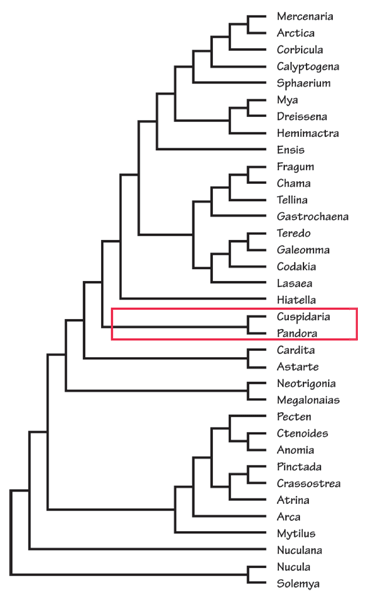 The species in a clade have similar characters because they evolved from a common ancestor that possessed that character. The clade outlined in RED includes such familiar bivalves as Blue Mussels (Mytilus), Oysters (Crassostrea), and Scallops (Pecten). None of the species in this clade burrow, and none of them have siphons. 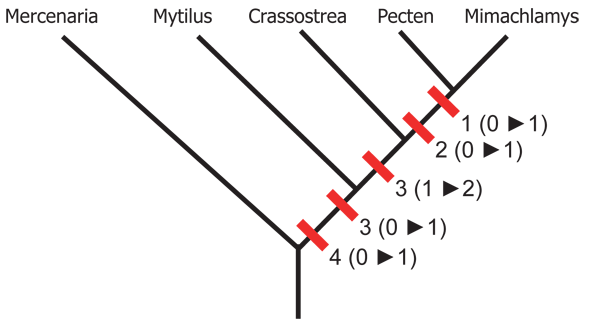 This clade (outlined in RED) includes the Dipper Clam and its relatives. 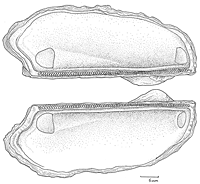 These bivalves have highly specialized gills and stomachs. 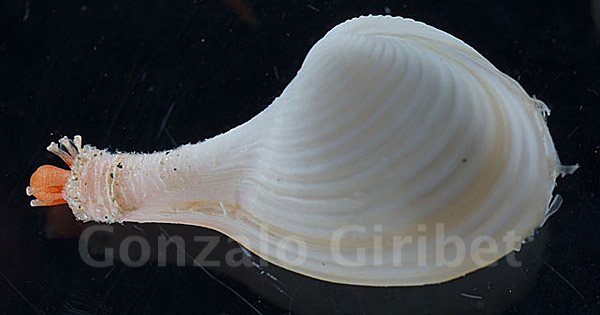 A living Dipper Clam (Cuspidaria). Just because members of a group of organisms share a similar feature or have similar common names does not necessarily mean that they form a clade (thus, it does not mean that they are related). In the next two trees, look at where bivalves called “mussels” and bivalves that live in freshwater appear on the tree. These two groups do not form clades - this tells us that both the long, pointed mussel shape and the ability to live in a freshwater habitat evolved more than once in bivalves. These four bivalves (outlined in RED) live in fresh water. We can also map characters on the tree to see how they changed over time resulting in the morphologies that we see in living species today. The species at the bottom of the tree (outlined in BLUE) have more primitive “taxodont” teeth — many small teeth of a similar size. 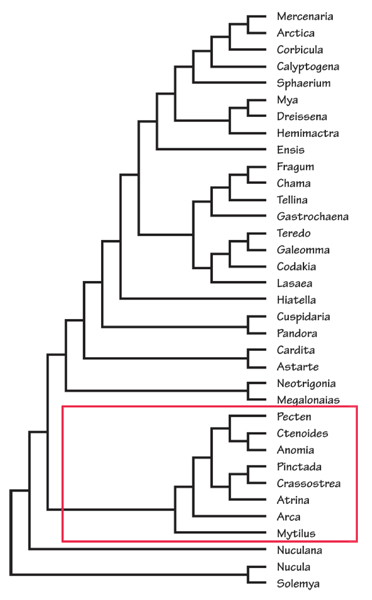 The species at the top of the tree (outlined in RED) have “heterodont” teeth — more than one kind of tooth on the same hinge. 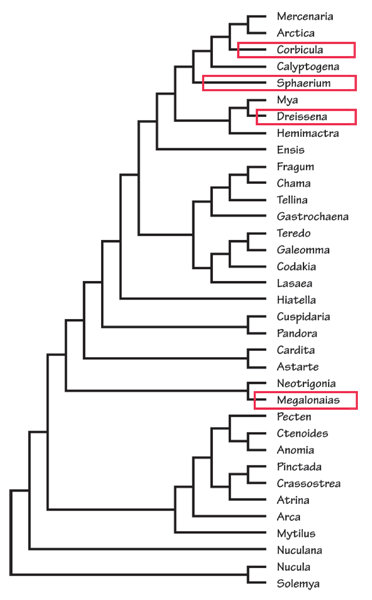 There are also some species in the heterodont clade that have lost their teeth entirely (highlighted in GRAY). 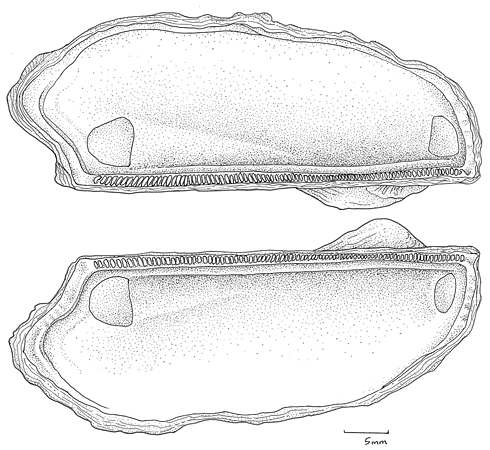 The taxodont hinge teeth and internal muscle scars of the Ark Clam, Arca noae. The heterodont hinge teeth and internal muscle scars of the Venus Clam, Venus verrucosa. The presence of siphons (outlined in RED) is spread across the tree. Siphons by themselves do not define a clade, and have likely evolved or been lost (those lacking siphons are highlighted in GRAY) many times. The siphons of a living bivalve. A depiction of the relationships of life on Earth in an evolutionary context. The Tree of Life is often depicted as a detailed cladogram, and illustrates the idea that all life on Earth is related. for all life on Earth that models our current understanding of how species evolved. This tree is so large that we must depict it wound in a circle, just to fit on the page! 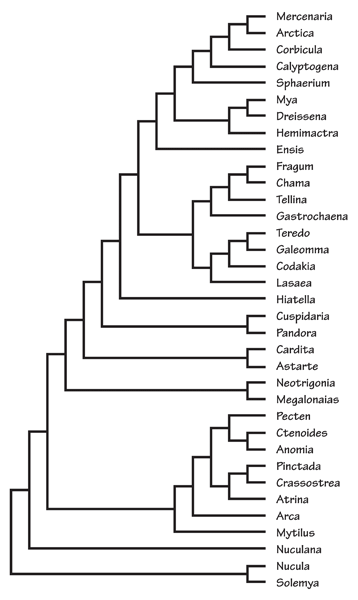 This and similar cladograms below modified from Giribet, G., & W. C. Wheeler. 2002. 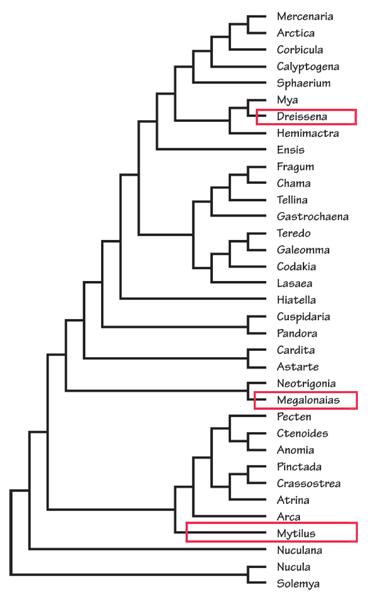 On bivalve phylogeny: a high-level analysis of the Bivalvia (Mollusca) based on combined morphology and DNA sequence data. Invertebrate Biology, 121(4): 271-324.